What it’s about: The Kellehers have come to Maine each summer to stay in the cottage by the sea since Alice’s husband won the property in a game of cards after the war and carved her initials into the tree at the gate. They brought their children and now their children’s children and even their great-grandchildren are coming. But Alice doesn’t necessarily welcome the intrusion. She never wanted any of this—family, children underfoot, the life of a good Irish Catholic housewife. Wrapped up in her own guilt about events from her youth that changed the course of her life, Alice has promised the house to the Catholic Church after her death—unbeknowst to her family who expect to continue spending summers there in perpetuity. Alice’s granddaughter Maggie joins her in the cottage for a month, fresh off a break-up with her volatile artist boyfriend and pregnant with his child. Maggie is surprised to find solace in the house and courage to accept the challenge of raising a baby on her own. Of course, she can’t tell Alice any of that. Nor can she tell her Aunt Ann Marie, who shows up by surprise one morning. Ann Marie is a Kelleher by marriage, but rather than being the black sheep, she’s something of a too-white one. Always taking on Alice’s care and modeling the behavior of a ’50s housewife, Ann Marie can’t seem to admit even to herself that her own marriage is not what it once was and her perfect children haven’t turned out to be that perfect. She retreats to the cottage to work on a dollhouse she’s entered in a competition and daydream—harmlessly really—about starting an affair. 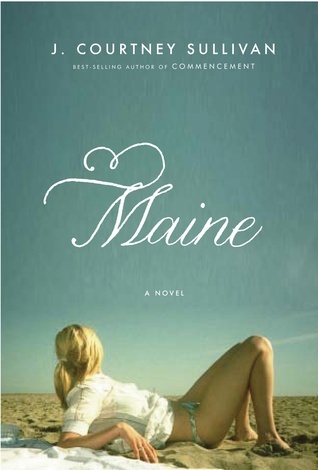 I read Maine by a lake and found it to be an absolutely perfect summer read. It’s like The Corrections only with more sun and sand and less anger. The characters are all flawed, but relatable. The book alternates between four women’s points of view and I enjoyed seeing their ships passing in the night as each interprets events differently and shares their side of the story. So many misunderstandings arise from misses in communication. The Kelleher women have more in common than they want to admit, but can’t stop hurting each other. Call it pride or fear, they’re each boxing up a part of themselves and boxing out the ones they love. This is a story of evolving generations of a family and the way a single event can affect people so differently. It’s about suppression and sacrifice versus self-awareness and fulfillment. It’s about alcoholism and emotional abuse, but also lobster rolls and Irish folk songs. It’s a story about women—the way we talk to each other, the way we tear each other down or build each other up. And it’s just a good story. The writer’s voice is clear and fluid and I felt connected to these women and invested in how things would play out. Would I recommend? Most definitely. The perfect setting for reading Maine is on the shore somewhere, but it has more than enough depth to hold up in your living room come winter.